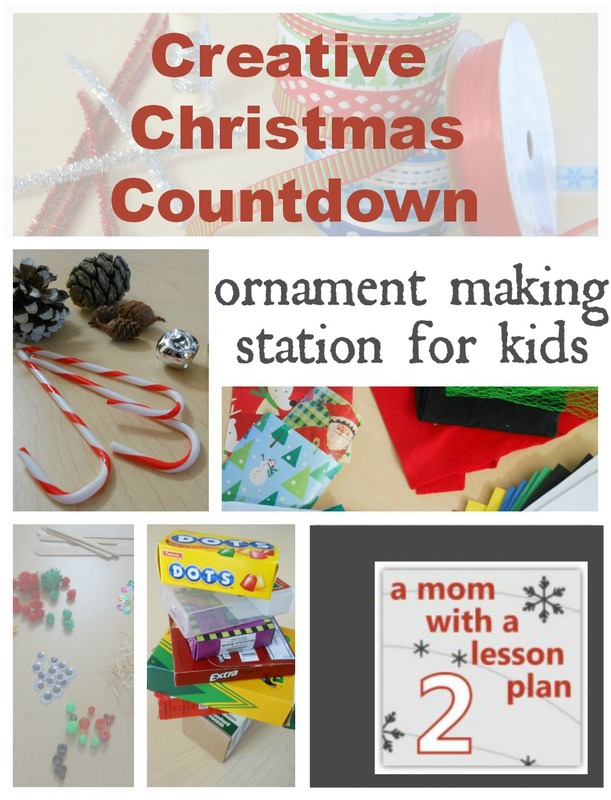 This year I am sharing our home made Christmas decoration station as a part of the Creative Christmas Countdown, if you missed it make sure to check it out… 24 fantastic ideas from 24 amazing bloggers. Setting up an ornament making station is one of our family traditions. It started back when M and M were 2 and 4 years old… and it has been my favorite tradition ever since. While their skills and materials have increased over the years one thing has remained the same, their creative spirit always shines through. Our art center has become the central hub of our home, it is where you can find the kids first thing in the morning and right before bed each night. Creativity is a reoccurring theme around here. Switching out a few items to add a little Christmas kick was easy, don’t worry if you are starting from scratch. You will be surprised how cheap and easy it is! BEFORE YOU START!!! These materials are just to get you thinking. If you close up the computer, grab a box and start searching through your house I’m sure you will find everything you need to get your kids creating home made Christmas decorations. The most important part of these home-made Christmas decorations is that they are KID designed and KID made. Collect materials with no expectations in mind. Let them explore the materials (and perhaps add their own). Be proud of what they create (even if you can’t identify it). Sit back and watch their passion… it just might inspire you! If there is place right next to your art area for a tree…PERFECT! If not, make some room near the bottom of your family tree. That way the kids can hang up their work. Having a base for the ornaments and a way to attach everything is really important. Get creative with your collection but here’s a list to get you started. other things can be glued to! Yes this is the place I spend a little bit of money. (Hee hee, we are talking very little money!) I have a small box labeled holiday that I keep out of the kids reach which makes saving the left over supplies easy! When you are looking for Christmas art supplies think beyond the craft section. Some decorations can be cut up and pulled apart to offer interesting pieces for making home made Christmas decorations. I wouldn’t be me if I didn’t add a little learning to our home made Christmas decorations! One way to encourage new little readers and writers to practice is by adding it wherever you can. In our art center we have name cards (the kind you can get at the teacher supply store and maybe Target) I wrote out the names of friends and family that are close to us. That way they can practice writing Grandma, Aunt L and each other’s names whenever they feel like it. You can do the same thing with Christmas words OR you can make your own cards like I did. 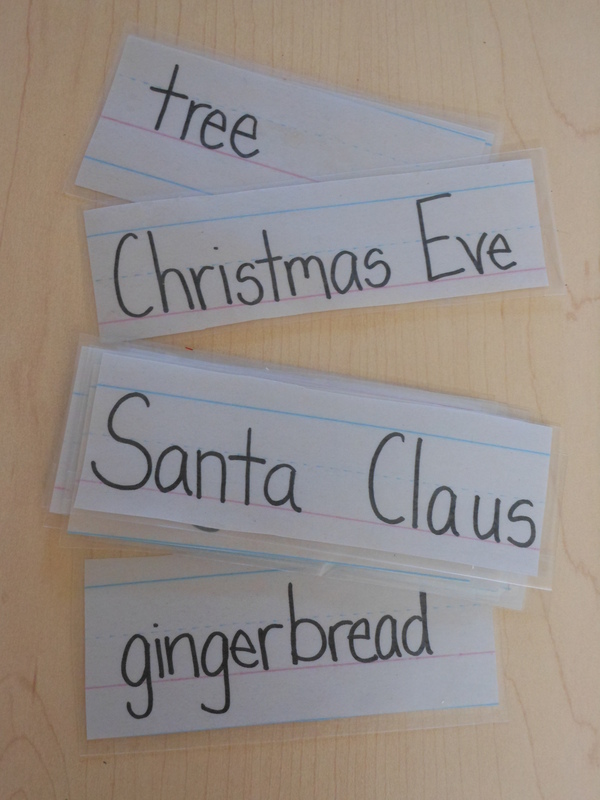 I wrote out words that might get the kids interested, cut them out and used contact paper to seal them up. Here’s what the kids have done so far. Notice the wide range of difficulty for each project! If you are new here, WELCOME! Pick your favorite way to follow amomwithalessonplan. Just love the Ornament Station. Such a lovely idea and a great way to let kids just “create”. Wonderful! Thanks Maggy and thanks for this wonderful opportunity! Wonderful post, Jillian! I love that the materials are set out as a bit of a “craft buffet” for the children to create freely with! Their creations are so sweet! Great list of suggested materials too! What a wonderful way to recycle every day items into treasures! Thank you so much Jackie! I like to set the materials out in a way that would be appealing to me… and it makes for easier clean up! LOVE this idea – am totally doing this today!! That’s when we started. Use stickers, tape and whatever materials they are already comfortable with. Your littlest little one will probably enjoy placing things on the tree without necessarily “creating” anything. I think the main changes I’ve made in the last two years is adding the hot glue gun and stapler. If you punch holes in square pieces of paper they can color them or add stickers or glue objects to them and then have something to hang up. Since it wouldn’t be safe to leave all of the “little” pieces out and you probably don’t want a 1 year old with access to crayons all the time your art station could be super simple and held in a box that come out with supervision. Beautiful Jill, as always super organised you are! I love how open ended this idea is. What pretty ornaments! Phenomenal idea!! We will be setting a station like this up asap. Thank you Amy! I was able to fix it right after you left the comment. YOU ARE AWESOME!!! I love, love, love this. Very creative!! Great idea. My favorite is the candle stick. Those Christmas decorations are awesome!!! I love this idea sooo much. Fantastic post. Sharing. I’m very excited about learning more. I love this. My kids love getting creative and make beautiful things throughout the year. But at Christmas we tend to get stuck in the rut of making paper chains and not much else. This year I’ve already designated the bottom of the tree to them and they’ve picked new decorations to put there, but I’ll definitely be encouraging them to make their own and add them to the tree. Awesome!!! We were about to make paper chains and Big M came up with his own version of the count down. Very cute! My kiddo likes his little art table too and could sit there for hours in a day. I’m going to try this in a box which we can get out from time to time. My youngest is only 10 months old and even if he only put one sticker on one box I wouls love and cherish the ornament forever! Yes a box would make it easier for such a little one. I love looking at the beginning ornaments from when M and M were so small. It’s neat to see how much they’ve changed in just one year. We have a box. And my 10 month old helped me stick a sticker on a clear lid, so I’m very happy with that. My 3 year old started doing a rubbish collection with his truck. He took away the card, and the ribbon, and the shapes, and the stickers, and everything else he could get his hands on! He loves his pretend play at the moment. We’ll make ornaments another day, I suppose. Great inspiration tonight!! I need to let my class do their OWN creative work but I too often expect theirs to look like mine in the end! Shame on me!!! What great ideas! My 3-year old daughter already has a table all her own for art (I need to clean up the mess!) so it shouldn’t be too hard to set her up for Christmas. It’s getting really fun to watch her and see what she comes up with — suddenly, she draws the cutest stick people! What a cute advent calendar! I love how hands on it is.